Microsoft provides the core business and productivity programs that organizations rely on. Regardless of your industry or career path, a clear understanding of Microsoft technologies (and the certifications to back up your knowledge) will help you accelerate your IT career. In April of 2012, Microsoft Learning launched the latest iteration of its Microsoft Certified Professional (MCP) program. The new generation of Microsoft certifications reflects the increasing importance of cloud-computing competencies, while still validating the skills to build on-site business solutions using Microsoft technologies. 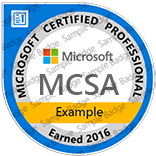 MCSA Microsoft Certified Solutions Associate is a certification program intended for people who seek entry level jobs in an IT environment.